I have a multi-project (~10 modules) of which building takes about 20-30 seconds each time. When I press Run in Android Studio, I have to wait every time to rebuild the app, which is extremely slow. Is it possible to automate building process in Android Studio? Or do you have any advice on how to make this process faster? 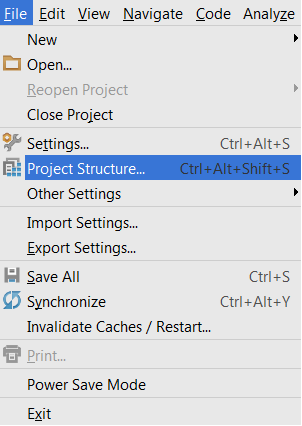 In Eclipse, thanks to automatic building, running the same project on an emulator takes about 3-5 seconds. I'm sorry, but upgrading development station to SSD and tons of ram has probably a bigger influence than points below combined. 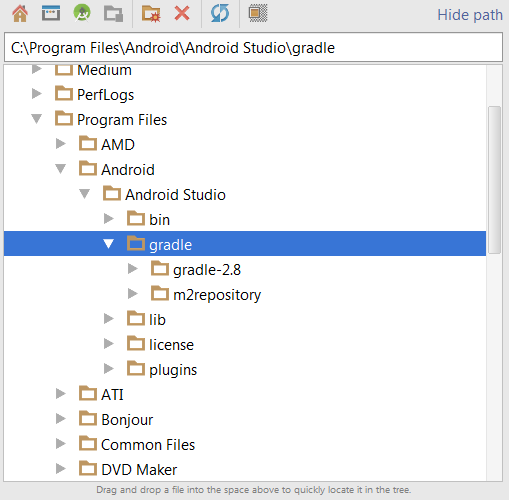 Increasing build performance has major priority for the development teams, so make sure you are using latest Gradle and Android Gradle Plugin. # configured through the IDE. # The Gradle daemon aims to improve the startup and execution time of Gradle. # When set to true the Gradle daemon is to run the build. # Specifies the JVM arguments used for the daemon process. # The setting is particularly useful for tweaking memory settings. 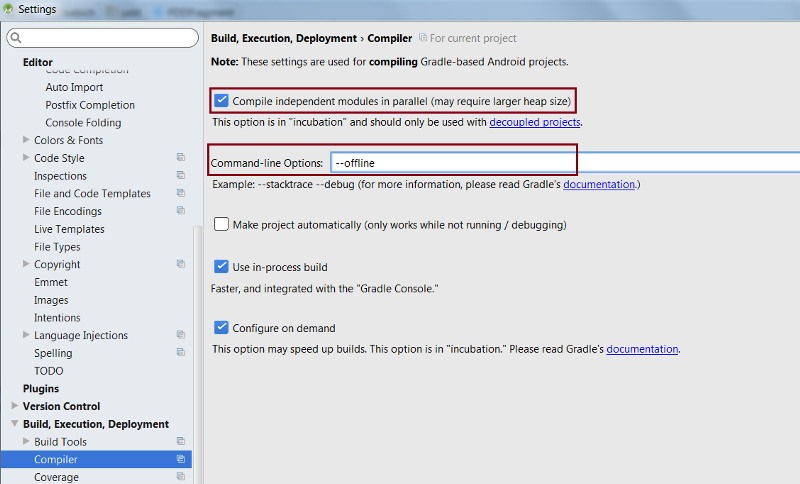 # When configured, Gradle will run in incubating parallel mode. 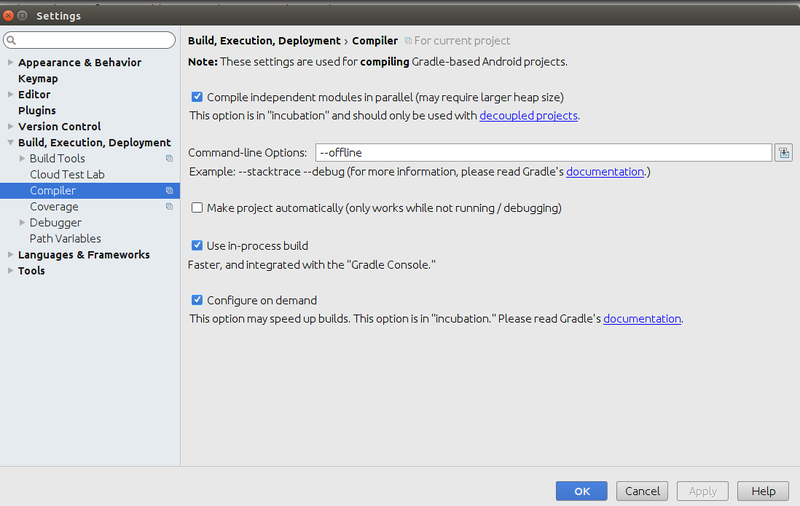 # Enables new incubating mode that makes Gradle selective when configuring projects. # Only relevant projects are configured which results in faster builds for large multi-projects. # Set to true or false to enable or disable the build cache. # If this parameter is not set, the build cache is disabled by default. 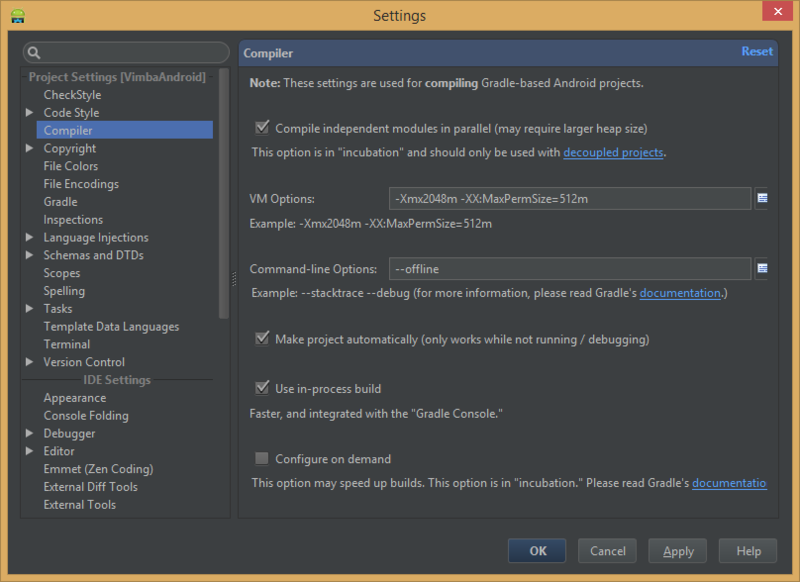 It is possible to tweak Gradle-IntelliJ integration from the IDE settings GUI. 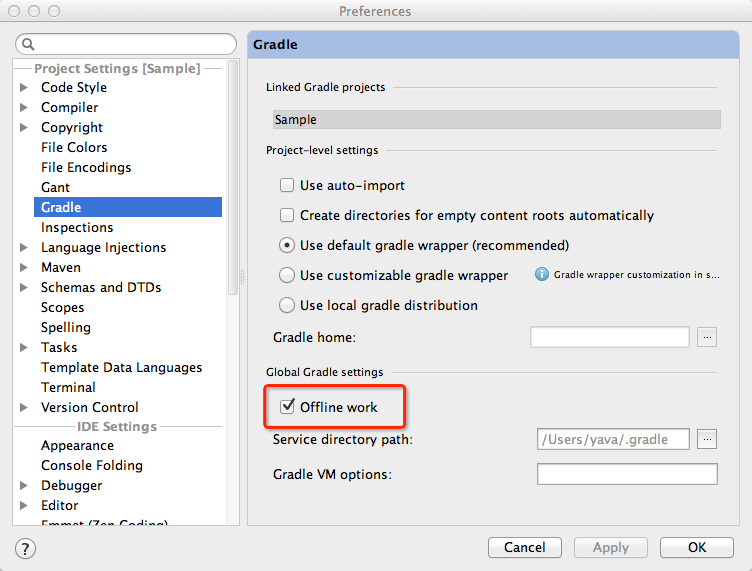 Enabling "offline work" (check answer from yava below) will disable real network requests on every "sync gradle file". One of the slowest steps of the apk build is converting java bytecode into single dex file. Enabling native multidex (minSdk 21 for debug builds only) will help the tooling to reduce an amount of work (check answer from Aksel Willgert below). Prefer @aar dependencies over library sub-projects. Search aar package on mavenCentral, jCenter or use jitpack.io to build any library from github. If you are not editing sources of the dependency library you should not build it every time with your project sources. Consider to exclude project and cache files from antivirus scanning. This is obviously a trade off with security (don't try this at home!). But if you switch between branches a lot, then antivirus will rescan files before allowing gradle process to use it, which slows build time (in particular AndroidStudio sync project with gradle files and indexing tasks). Measure build time and process CPU with and without antivirus enabled to see if it is related. Gradle has built-in support for profiling projects. Different projects are using a different combination of plugins and custom scripts. Using --profile will help to find bottlenecks. You can ignore gradle update-to-date checks. Searched everywhere for this and finally found a solution that works for us. Enabling parallel builds (On OSX: preferences -> compiler -> gradle -> "Compile independent modules in parallel") and enabling 'make project automatically' brought it down from ~1 min to ~20 sec. Thanks to /u/Covalence. I recently bought a new SSD and went from Windows to Linux.My build times are now an order of magnitude faster, and no longer annoying. Though it does not directly answer your question as to why it's slower than eclipse, it shows that the process is disk-bounded and an upgrade to an SSD might be a (somewhat expensive) solution. I'm guessing there will be people googling the issue and ending up here, who might appreciate my experience. If using google play services, depending on just the libraries you need instead of the whole blob can make things faster. The latter brings 20k methods (see blog) into the classpath, which might tip the total method count over 64k. Ever feel like you are waiting for the builds to complete in Android Studio for minutes? Me too. And it’s a pretty annoying. Fortunately, there are a few ways that you can use to improve this. 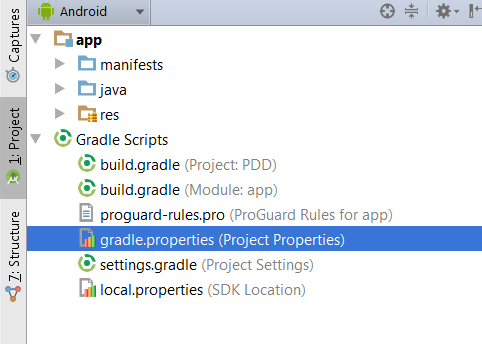 Android uses Gradle for building. The latest version is 4.6 has a huge performance boost over previous versions (see Release notes for details). Don’t forget to click Apply to save changes. Step 2: Enable Offline mode, Gradle daemon and parallel build for the project Offline mode tells Gradle to ignore update-to-date checks. Gradle asks for dependencies everytime and having this option makes it just uses what is already on the machine for dependencies. 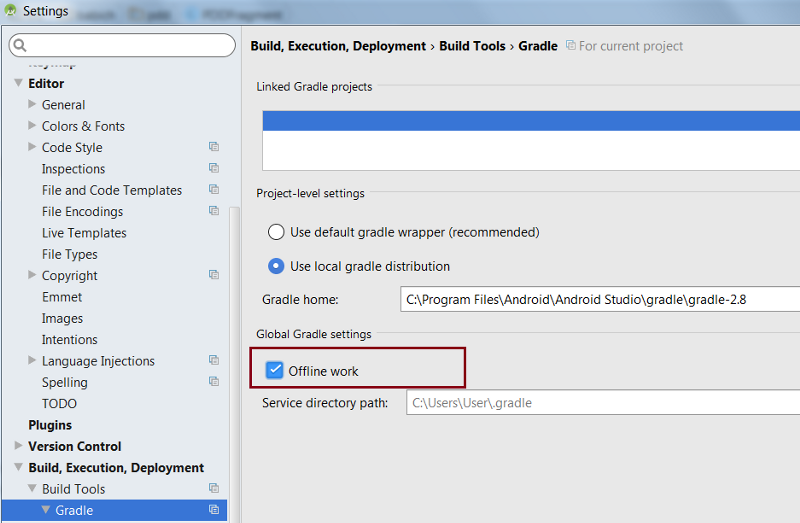 Go to Gradle from android studio Setting and click in Offline work box. Go to Compiler from android studio Setting and add “— offline” in command-line box and click Compile independent modules in parallel. The next step is to enable the Gradle daemon and parallel build for your project. Parallel builds will cause your projects with multiple modules (multi-project builds in Gradle) to be built in parallel, which should make large or modular projects build faster. These settings could enabled by modifiing a file named gradle.properties in Gradle scripts directory(i.e., ~/.gradle/gradle.properties).Some of these options (e.g. Complie modules in parallel) are available from Android Studio and also enabled there by default, but putting them in the gradle.properties file will enabled them when building from the terminal and also making sure that your colleagues will use the same settings. But if you’re working on a team, sometimes you can’t commit this stuff. # When set to true the Gradle daemon is used to run the build. For local developer builds this is our favorite property. # The developer environment is optimized for speed and feedback so we nearly always run Gradle jobs with the daemon. Using the daemon will make your builds startup faster as it won’t have to start up the entire Gradle application every time. The Gradle Daemon is not enabled by default, but it’s recommend always enabling it for developers’ machines (but leaving it disabled for continuous integration servers). FAQ about this mode could be found here https://docs.gradle.org/current/userguide/gradle_daemon.html. The parallel builds setting could be unsafe for some projects. The requirement is that all your modules must be decoupled or your build could fail (see http://gradle.org/docs/current/userguide/multi_project_builds.html#sec:decoupled_projects for details). See all list of parameters here: https://docs.gradle.org/current/userguide/userguide_single.html#sec:gradle_configuration_properties for details. Step 4: Disable Antivirus Consider to exclude project and cache files from antivirus scanning. This is obviously a trade off with security. But if you switch between branches a lot, then antivirus will rescan files before allowing gradle process to use it, which slows build time (in particular Android Studio sync project with gradle files and indexing tasks). Measure build time and process CPU with and without antivirus enabled to see if it is related. I hope this helps. Leave a comment if you have any question or some other tips for improving the build performance. In bin folder there's a studio.vmoptions file to set the environment configuration. In my case this is studio64.vmoptions Add the following lines if they're not added already and save the file. In my case I've 8GB RAM. In case of using mac, at first I couldn't find the vmoptions. Anyway, here's a nice article about how we can change the vmoptions in MAC OSX. Quoting from this article here. For me the speed is now equal to Eclipse. You could make the process faster, if you use gradle from command line. There is a lot of optimization to do for the IDE developers. But it is just an early version. For more information read this discussion on g+ with some of the devs. If anyone is working a project which is synced via Subversion and this still happening, I think this can slow the process of workflow in Android Studio. For example if it work very slow while: scrolling in a class,xml etc, while my app is still running on my device. Go to Version Control at Preferences, and set from Subversion to None. All answers are great, and I encourage to use those methods with this one to improve build speed. It introduces a new build cache feature, which is enable by default, can speed up build times (including full builds, incremental builds, and instant run) by storing and reusing files/directories that were created in previous builds of the same or different Android project. # Set to true or false to enable or disable the build cache. If this parameter is not set, the build cache is enable by default. After change this settings my compile duration 10 minutes changed to ~10 secs. type "--offline" in command-line Options box. check the “Compile independent modules in parallel” checkbox. You will not be able to pull down the latest versions of the dependencies identified in your build.gradle file. It runs faster because it uses a cached snapshot of those imported libraries. Important Note: When you deploy the application remove this settings & build with latest versions of dependencies. Gradle builds went from 8 minutes to 3 seconds. 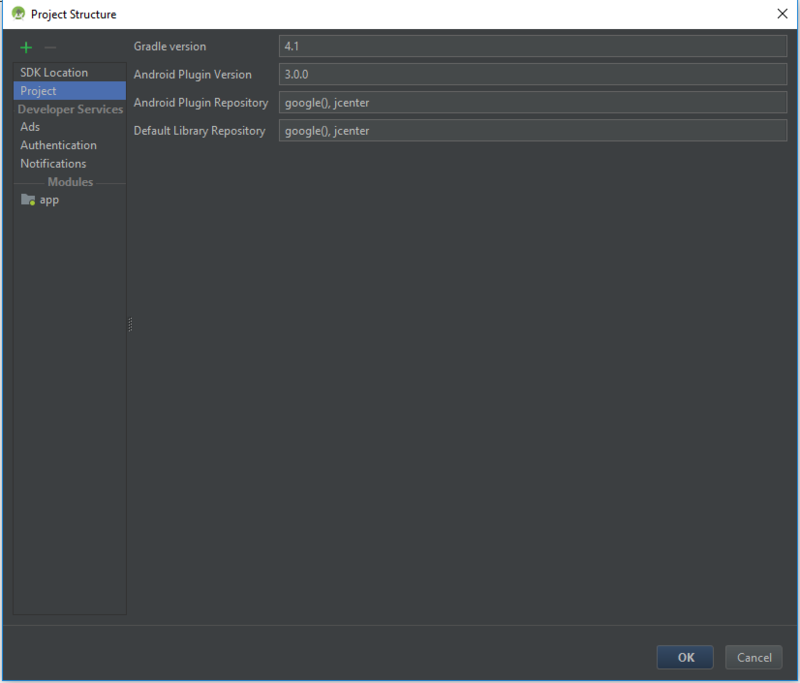 Here's what helped this beginning Android programmer (former professional programmer, years ago) in speeding up Android Studio 2.2. I know this is a rehash, but, just summarizing in one place. yes for "Offline work" (this is perhaps the most import setting). yes for "Compile independent modules in parallel" (not sure if this does in fact help utilize multicore CPUs). // keep min high so that restarted apps can be hotswapped...obviously, this is hugely faster. // enabling multidex support...does make big difference for me. Additionally, testing on a physical device instead of the emulator is working well for me; a small tablet that stands up is convenient. Android Studio 3.0 includes new DEX compiler called D8. "The dex compiler mostly works under the hood in your day-to-day app development, but it directly impacts your app's build time, .dex file size, and runtime performance." "And when comparing the new D8 compiler with the current DX compiler, D8 compiles faster and outputs smaller .dex files, while having the same or better app runtime performance." PS. It impove my build time by about 30%. Please follow the following steps. Enable offline mode : Please check below print screen. Enable Instant Run : Please check below print screen. If you want to learn more about instant run please visit android developer site. 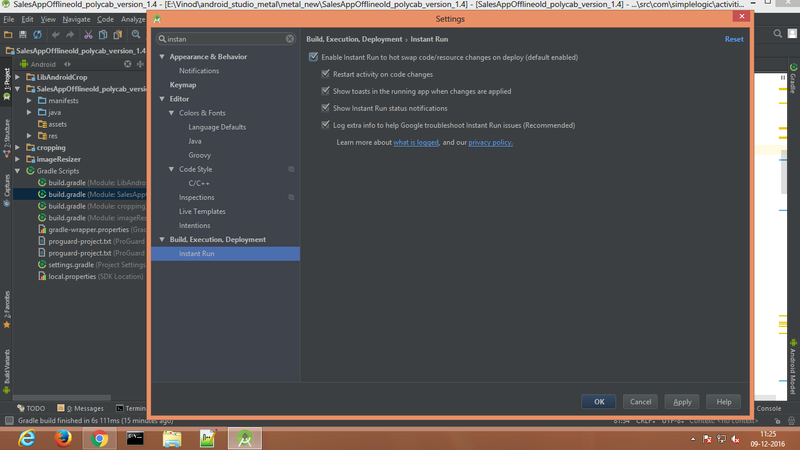 and now I finally can work without swearing to Android Studio & Gradle buildind scheme. In our specific case, the problem was due to having the retrolambda plugin, which forced all projects and subprojects to recompile everytime we tried to launch our application, even if no code had been altered in our core modules. Removing retrolamba fixed it for us. Hope it helps someone. Just try this first. It is my personal experience. I had the same problem. What i had done is just permanently disable the antivirus (Mine was Avast Security 2015). Just after disabling the antivirus , thing gone well. the gradle finished successfully. From now within seconds the gradle is finishing ( Only taking 5-10 secs). after change all to latest version my problem solved. A trivial change (to a resoruce xml) still took 10 minutes. As @rivare says in his answer, a command line build is mutch faster (took this down to 15 seconds). Here are some steps to at least make a trivial build fast from the command line for Windows. uninstall the apk from the phone directly (drag it to uninstall). When the build is finished, kill the BIG java process using Windows Task Manager. According to the android documentation, add this in the gradle file of app module. To run Android envirorment on low configuration machine. Studio contain Power safe Mode when turned on it will close background operations that lint , code complelitions and so on. Most of are using Android emulators on average it consume 2 GB RAM so if possible use actual Android device these will reduce your resource load on your computer. Alternatively you can reduce the RAM of the emulator and it will automatically reduce the virtual memory consumption on your computer. you can find this in virtual device configuration and advance setting. 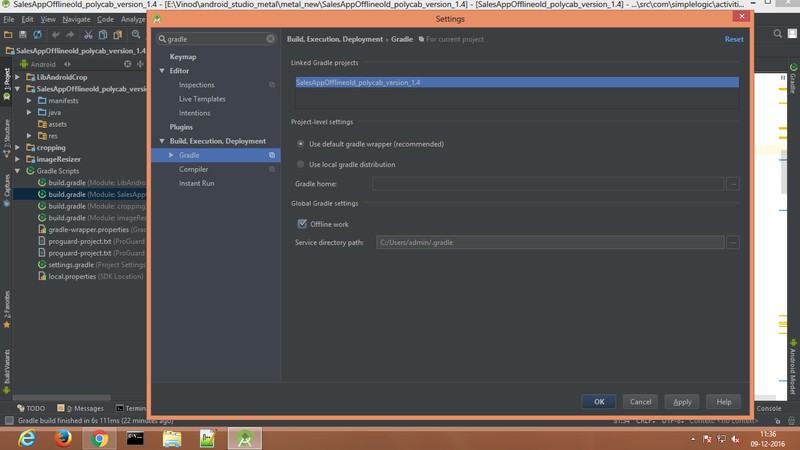 Gradle offline mode is a feature for bandwidth limited users to disable the downloading of build dependencies. It will reduce the background operation that will help to increase the performance of Android studio. Android studio offers an optimization to compile multiple modules in parallel. On low RAM machines this feature will likely have a negative impact on the performance. You can disable it in the compiler settings dialog. Not the answer you're looking for? 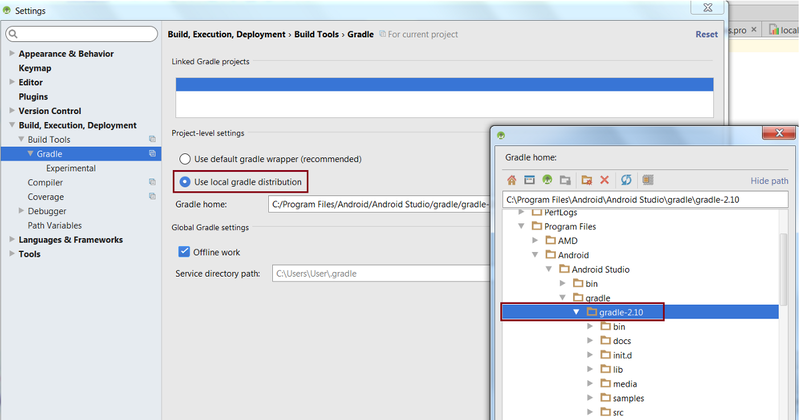 Browse other questions tagged android gradle android-studio build.gradle or ask your own question. Android Studio - How can we make an app compile faster? 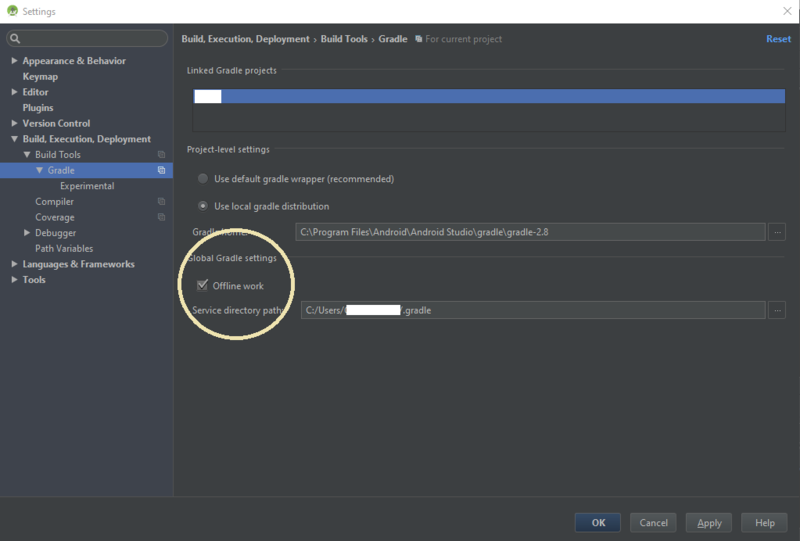 Does Android Studio use Gradle Daemon?